Note	: in order to use Rule Sets and Interceptor Rules , Decisions.FlowSets Module should be installed. To learn how to install Module in Decisions please click here	. 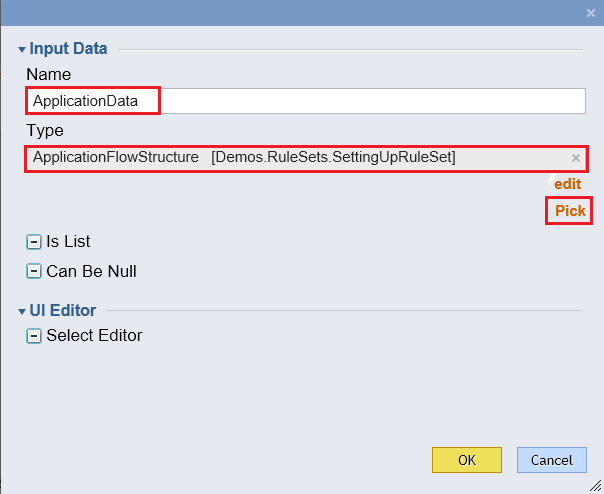 This tutorial demonstrates how to set up a Rule Set	in Decisions 4.0. Rule/Flow Set	is a set of Rules and Flows in Decisions that is targeted to work together in a process of complex data evaluation. 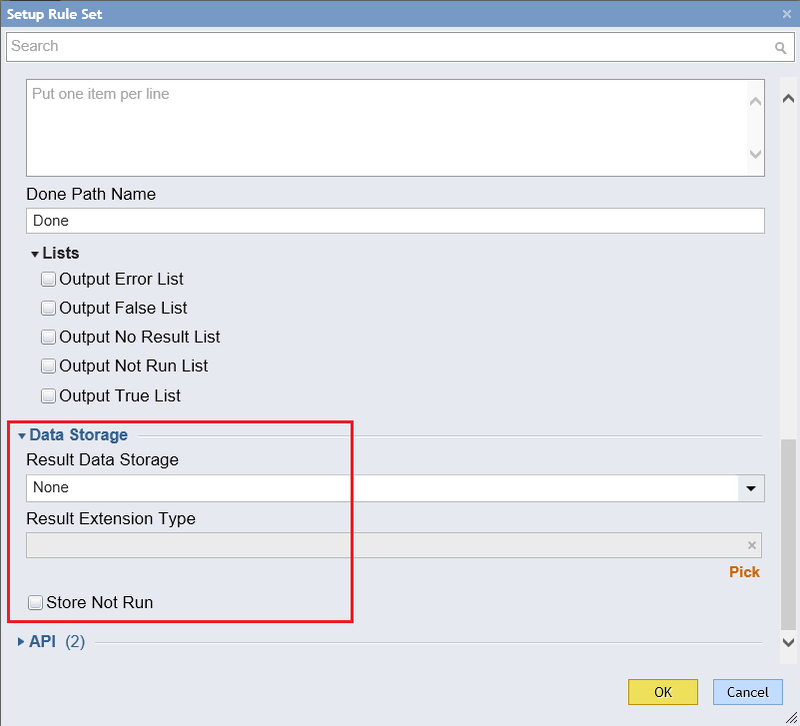 Rule Sets give the best flexibility in data validation. This document describes the key options and functionalities available with Rule Sets in Decisions 4.0. In this example we are going to demonstrate how to create a Rule Set	, overview Rule Set Settings	, and use a simple Rule Set	in the Workflow	process. First, we are going to create a simple Flow Structure	to use as an input for our Rule Set. 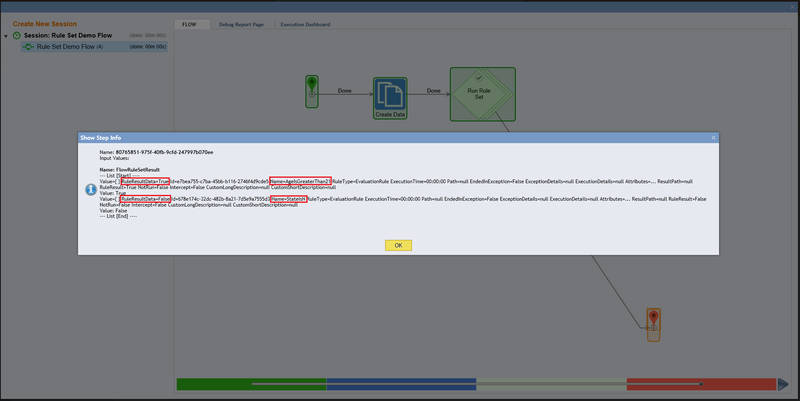 In the Designer Folder	we click Datatypes/Database > User Defined Types > Flow Structure	on Folder Actions Panel. 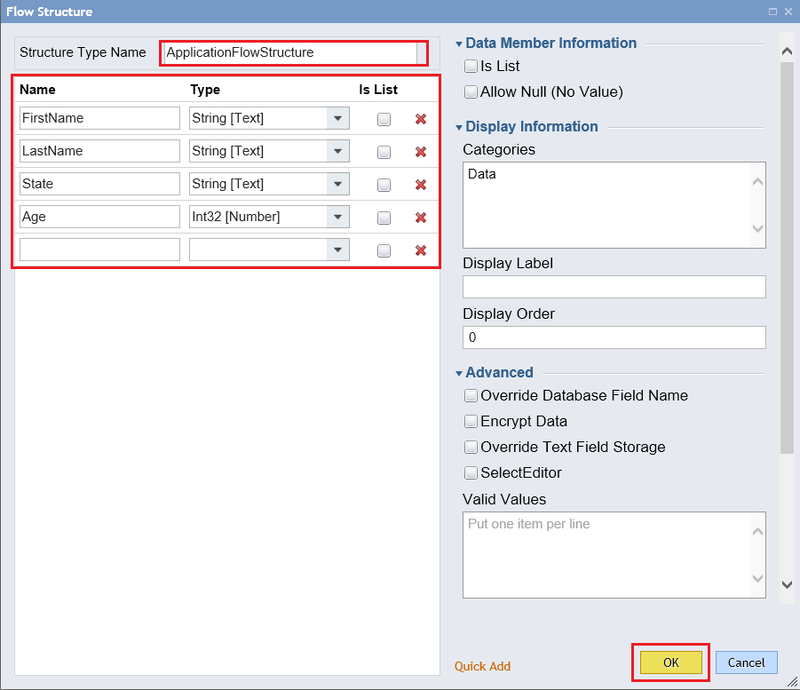 Then, in the Flow Structure	definition window we provide Structure Type Name	and add 4 Data Members:	FirstName, LastName, State, andAge. When finished, we click Ok	to save and continue. To create a Rule Set	in the Designer Folder	we click Create Rule > Create Rule/Flow Set	Action on Folder Actions Panel. In the resulting window we Name	Rule/Flow Set and click Ok	.
System creates a Rule/Flow Set Base Folder	. On the Rule/Flow Set View	of this Folder we can see Rule/Flow Set Settings	on the left-hand side and Rules and Flows in Set	on the right-hand side of the Page . To edit our Rule Set Settings we click Setup Rule Set	on Folder Actions Panel. 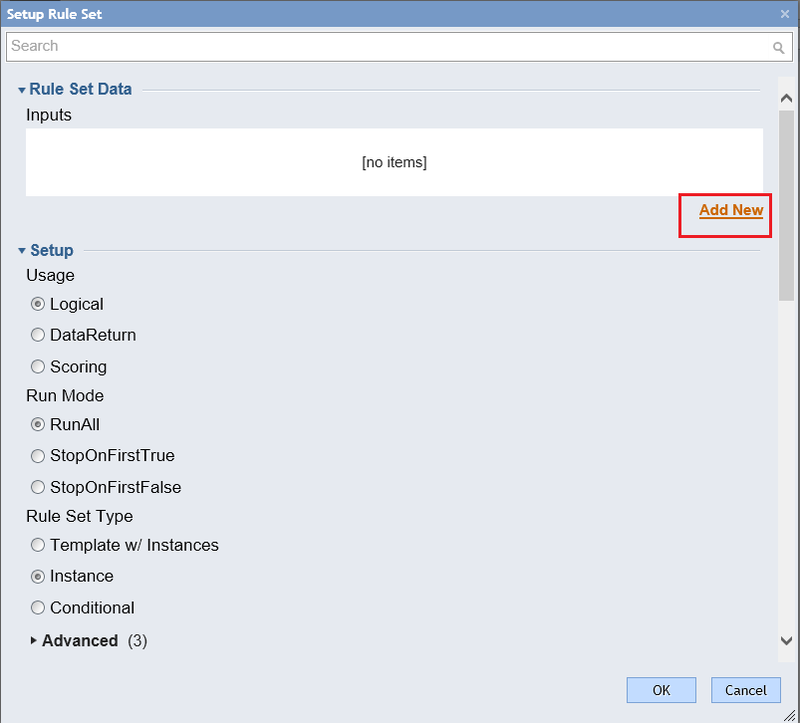 Setup Rule Set	window pops up… The first section of settings is Rule Set Data	where we can define our Rule Set Inputs	. The data that we define here will be required as a Step input for our Rule Set in the Flow Designer . Also, this data will be available across all Rules and Flows in this Set	. We click Add New	link to add new Rule Set Input Data. 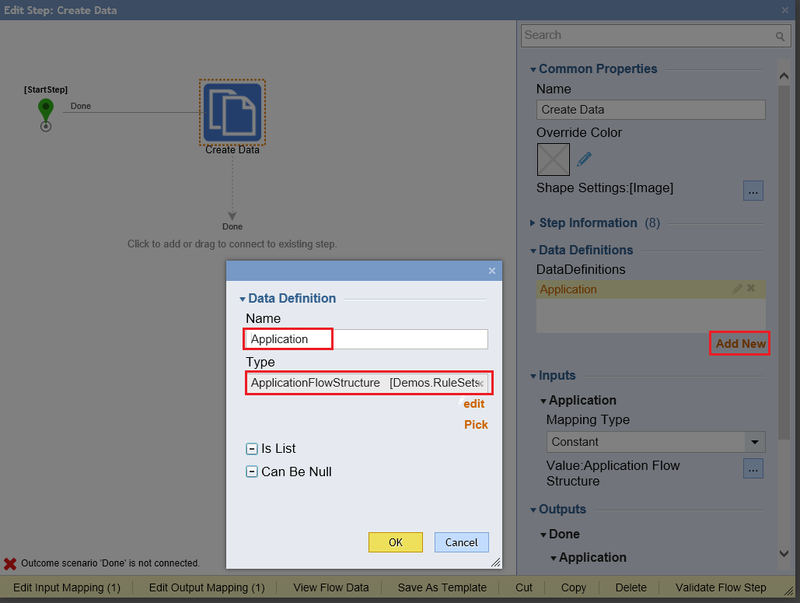 In the Input Data	definition window we Name	our Input Data and pick ApplicationFlowStructure	Type that we created previously in this tutorial. Then, click Ok	to save and continue. The next section of Settings is Setup	. Logical	– apply logical check to data. Best used for validations and data check. Data Return	– best use for data manipulations. Scoring	– used for statistical purposes when need to do manipulations on the rule results count. Run All	– run all Rules/Flows in the Set . 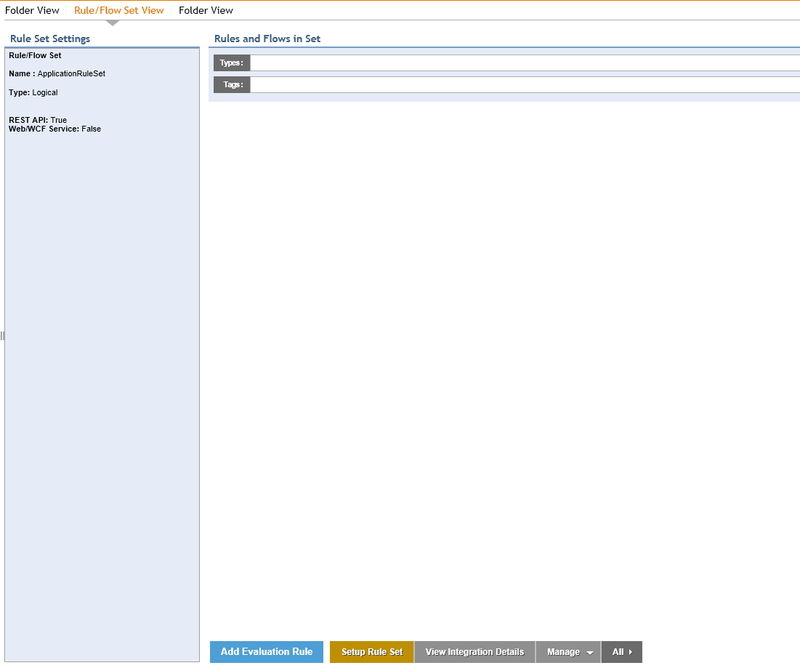 Stop On First True	– terminate Set execution on first Rule evaluating as True	. 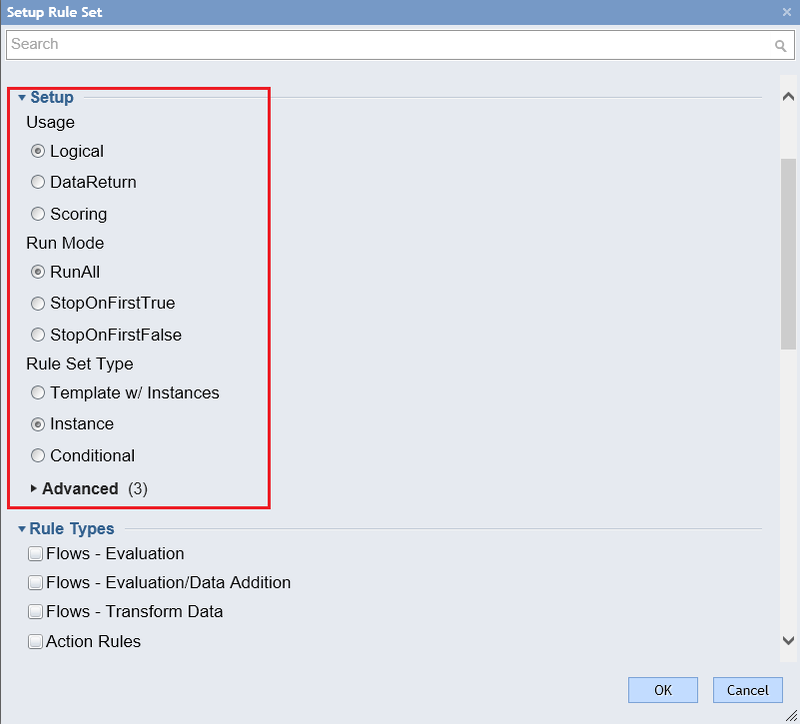 Stop On First False	– terminate Set execution on first Rule evaluating as False	. Template w/ Instances	– used when we want to create a base Set of Rules and then create specific sub-sets of Rules . Instance	– used when we want to create just a Set of Rules without specific sub-sets. Conditional – Rule Set Type that allows to create Rule Sets	within this Rule Set. In the Conditional Rule Set we can use Flows to Extend Data Inputs	for Flows/Rules based on the designed conditions or create Run Set Rule	controls to determine if we need to run the Set	based on designed conditions. Show Messages for Expired or Disabled Items. If we use Conditional Rule Set Type we can set Instance Create Name. 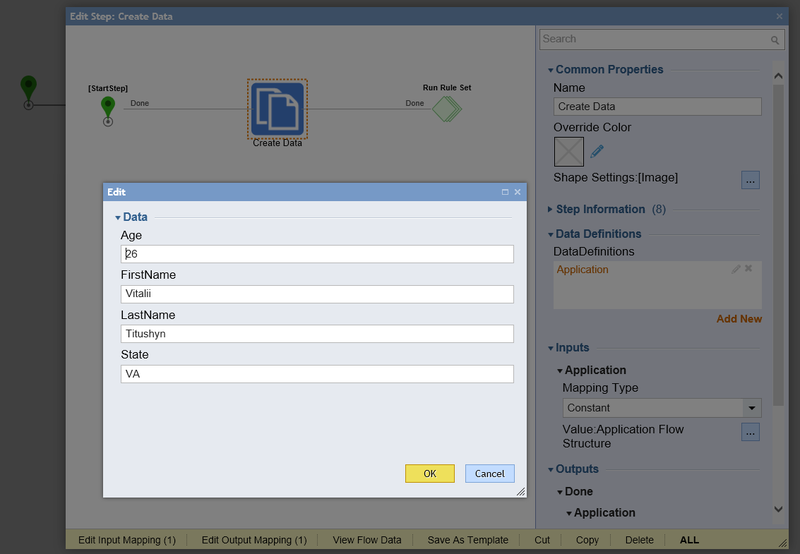 Flows – Evaluation	: to build a custom Flow that evaluates data and outputs ResultData . 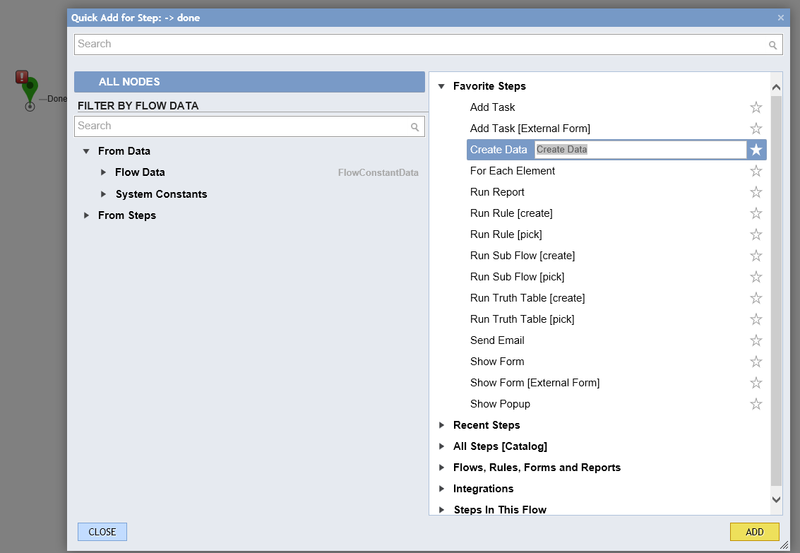 Flows – Evaluation/Data Addition:	to build a custom Flow that evaluates data and outputs ResultData and Rule Set Input Data. 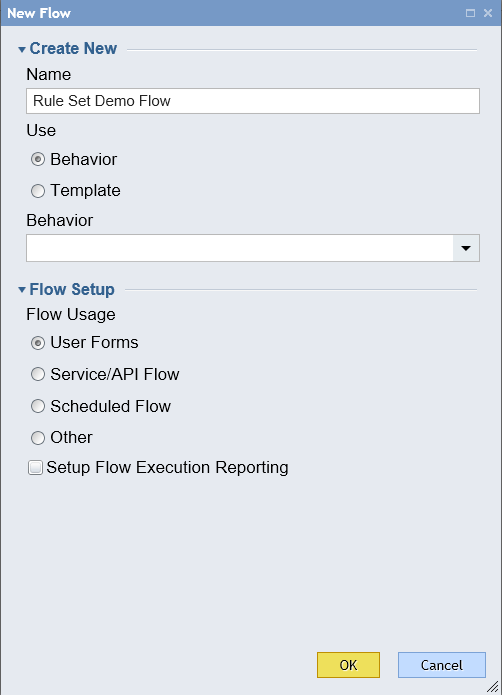 Flows – Transform Data:	to build a custom Flow for editing Rule Set Input Data. Action Rules:	to be able to use Rules that trigger different Flows based on the designed conditions. Truth Tables:	to use Truth Tables for more complex data validations. Allow Interceptor Rules: to build Rules that intercept and stop invalid data from being processed. Intercepted Flow: to build handlers for intercepted data. Next, Outcome Options	section. 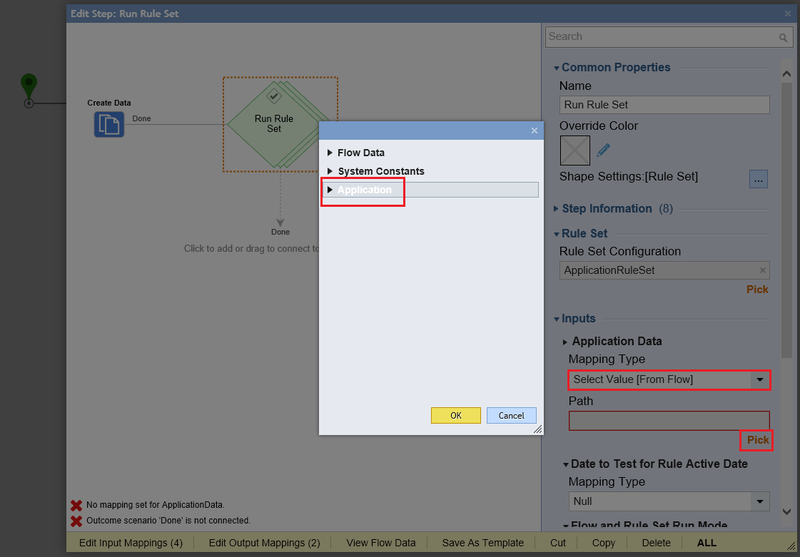 In this section we can set up the outcome scenarios for the Rule Set step in the Flow Designer. Show All Truth Path	– creating an outcome path that the Flow takes if all Rules in the Set evaluated ‘True’. Show All False Path	– creating an outcome path that the Flow takes if all Rules in the Set evaluated ‘False’. 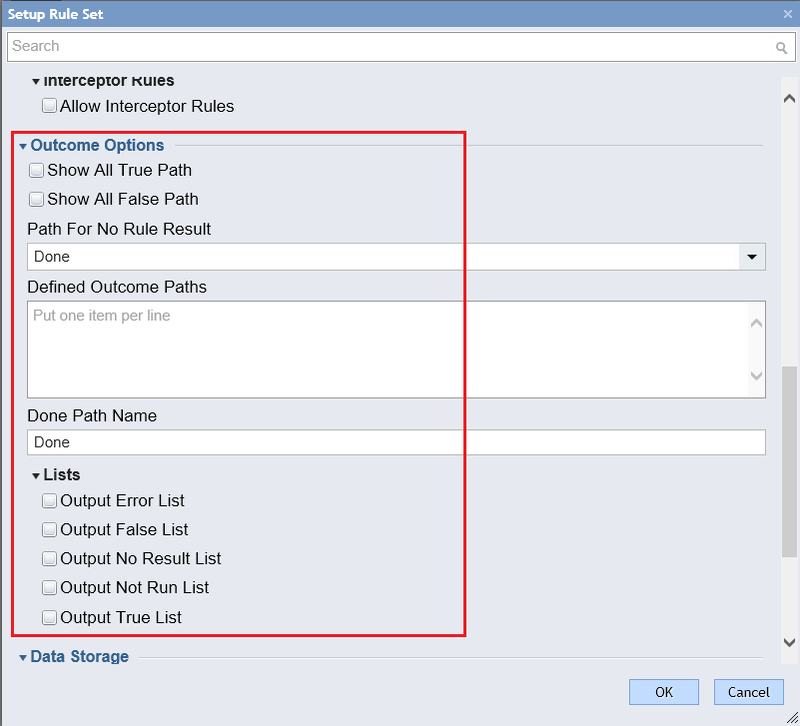 Path For No Rule Result	– default outcome Path that is used when Rule Set execution is completed. 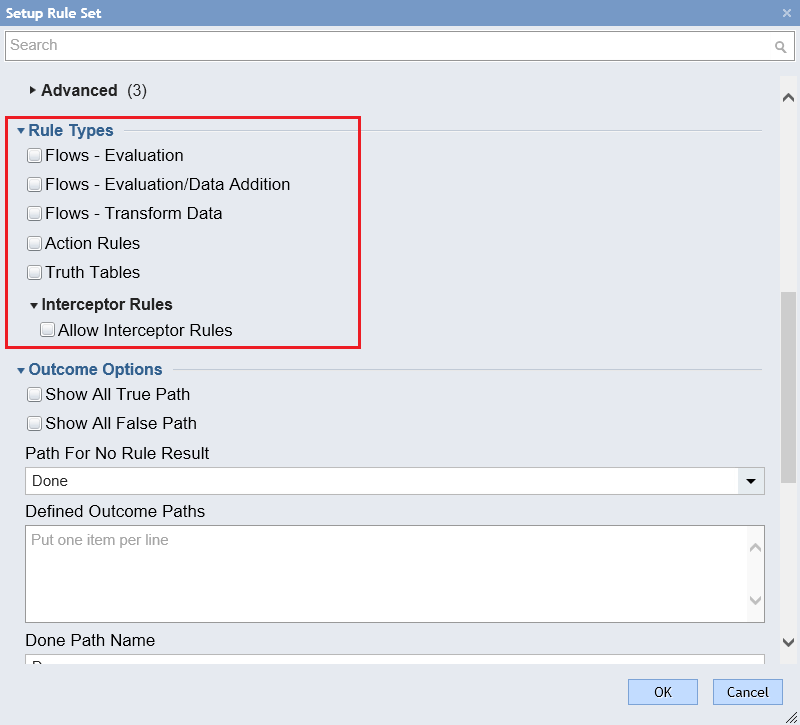 Defined Outcome Paths	– custom outcome Paths that may be used to continue Flow Execution on the desirable Flow Branch based on the Rule Set Results. Done Path Name	– to customize default ‘Done’ outcome name. Next section is Data Storage	. In this section we can define what data from the Rule Set Execution do we need to save and may define Result Extension Type. Note:	if we use Interceptor Rules , all intercepted data will be stored even if we do not set any Data Storage options. In the API	section we can set if we want to Allow REST API Calls	or Create Web Service	for this Rule Set. When we finished setting up our Rule Set we can click Ok	to save and continue. Next, we are going to add couple simple Rules to our Rule Set. 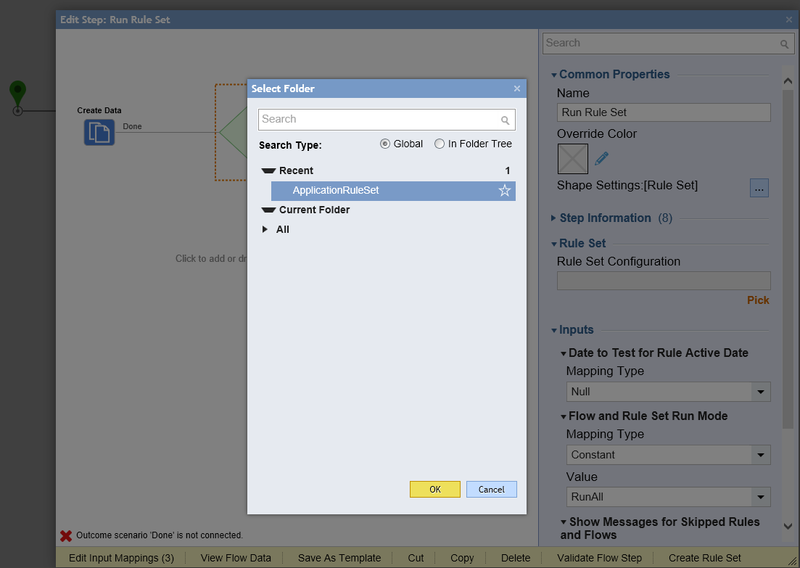 In the Rule Set Folder we click Add Evaluation Rule	on Folder Actions Panel. 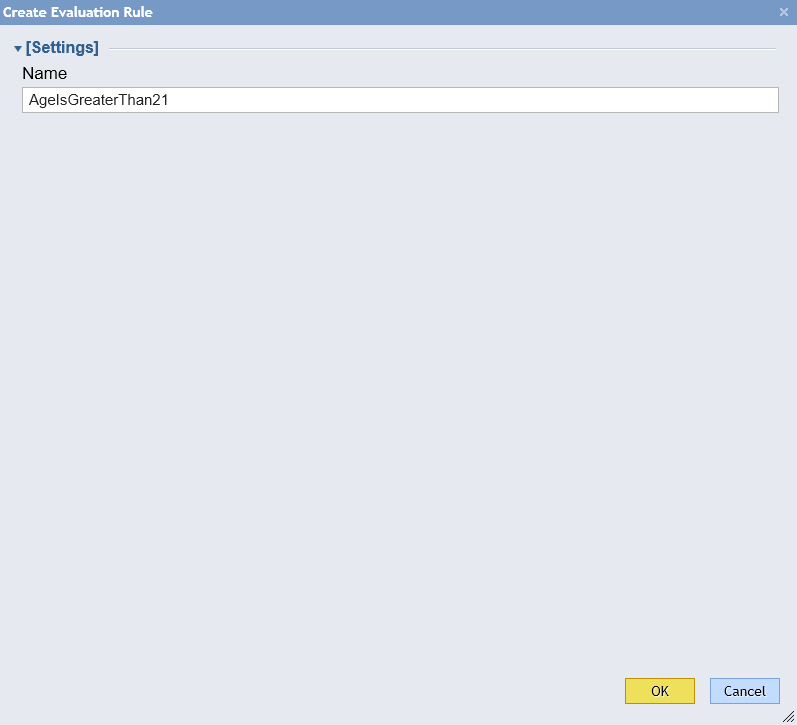 In the resulting window we Name	the Rule and click Ok	to proceed to the Rule Designer. In the Rule Designer we click Add New Rule Step	button on the Start Rule	window. 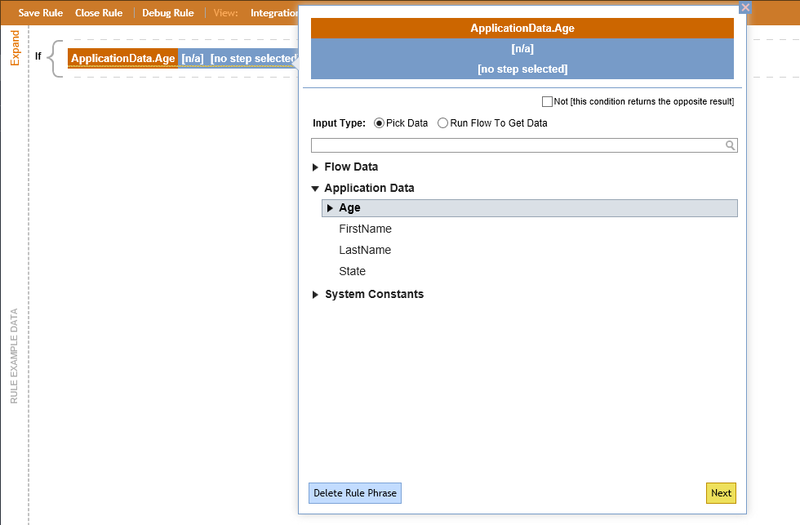 Then, we pick Age	data member from our ApplicationData	Rule Input and click Next	. On the verb	definition for our Rule Phrase we pick Greater Than	and click Next	. For the value we define Constant	‘21’ and click Done	. Our Rule should read ‘ApplicationData Greater Than 21’ . This completes our Rule . We can save the Rule and close Rule Designer. 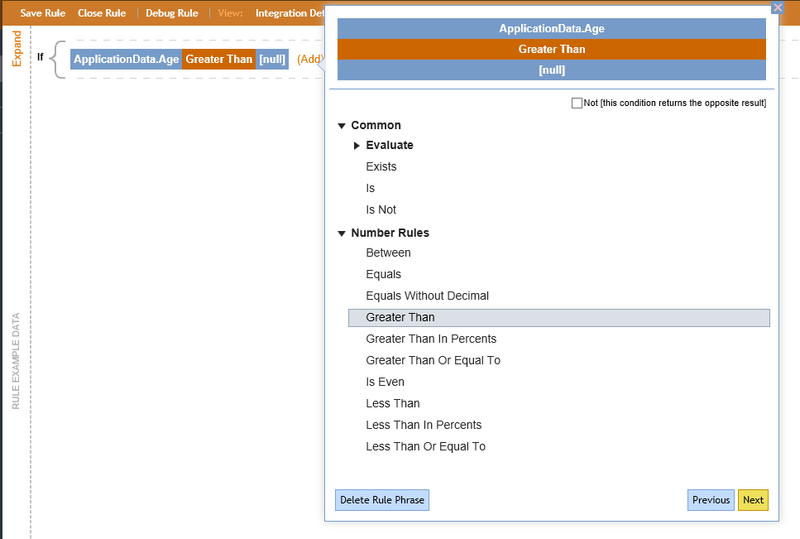 Next, in the similar manner we add another Evaluation Rule that reads***‘ApplicationData is NC’*** . Finally, we are going to demonstrate how to use our simple Rule Set in the Workflow . First, in the Flow Designer we are going to create an instance of our ApplicationFlowStructure	Type . We add Create Data	step from the Favorite Steps	category. 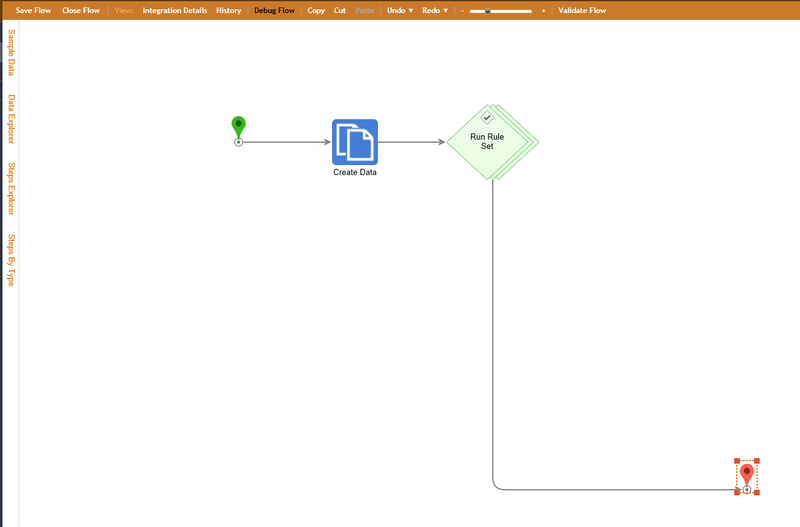 Next, in the Create Data step we define our ApplicationFlowStructure	Application	Data . 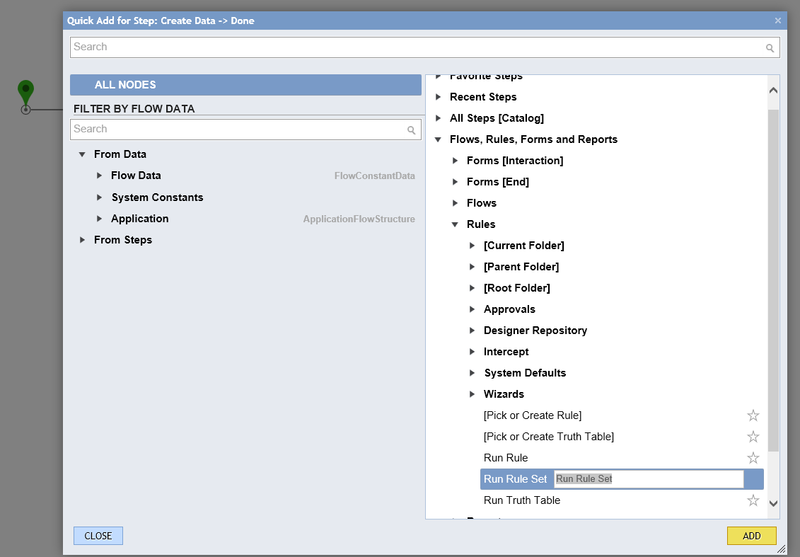 On the outcome from Create Data step we add Run Rule Set	step from Flows, Rules, Forms and Reports > Rules	category. 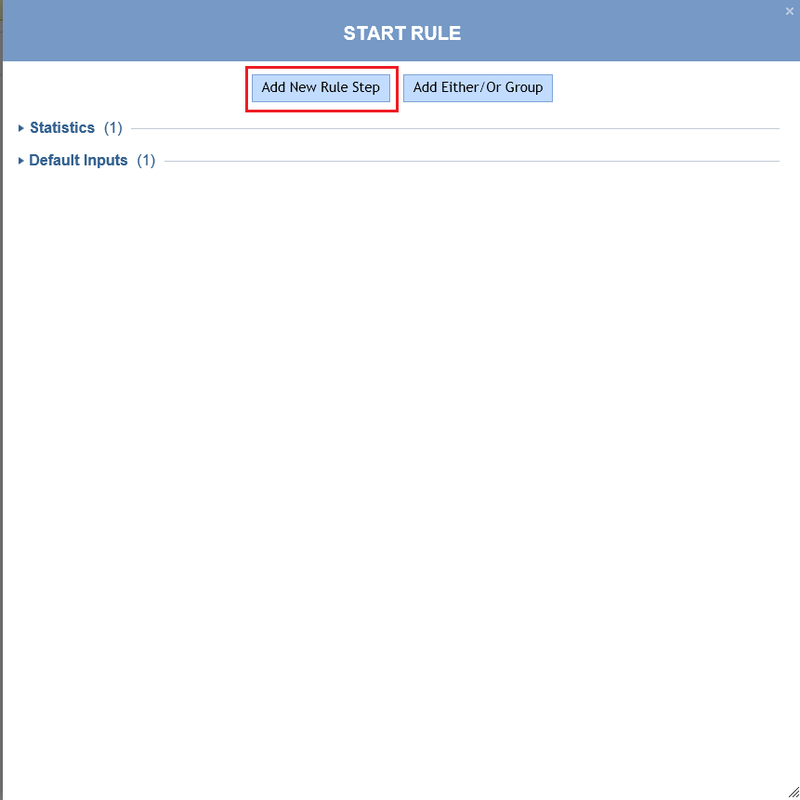 In the Run Rule Set step settings using Rule Set Configuration Picker	we locate and pick our ApplicationRuleSet	that we created previously in this tutorial. 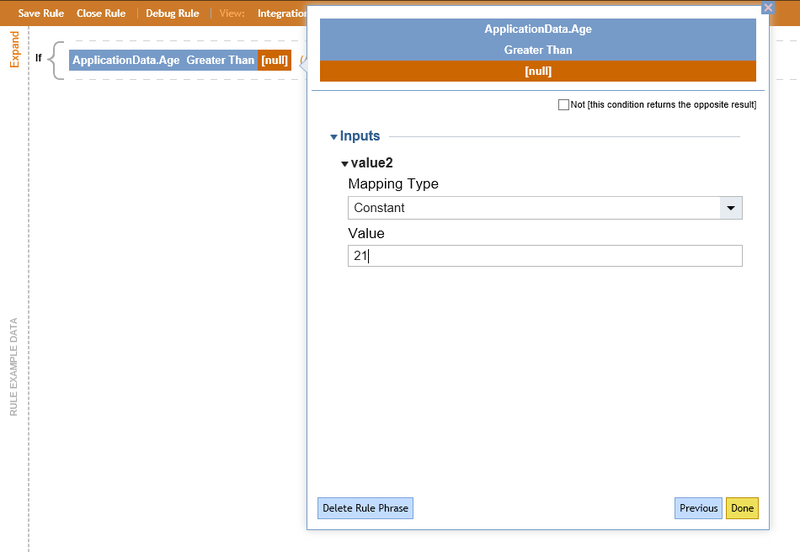 Then, for the ApplicationData	Rule Set Input we Select Value	of the Application	data defined in the Create Data	step. In the Create Data	step our Application	data members are set to Constant	values for the simplicity of this example. Next, we connect the outcome from our Run Rule Set	step to the End Step	in the Flow . Also, we are going to output FlowRuleSetResult	outcome from the Run Rule Set	step on the End Step	in our Flow . This completes our Flow . 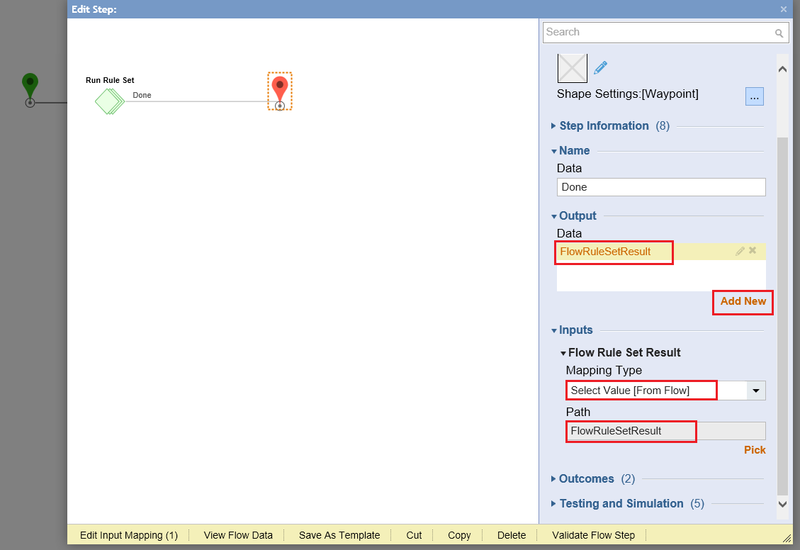 We can click Debug Flow	on the top panel of the Flow Designer to test the results of our Rule Set. First Rule evaluated ‘True’	because our Applicant was older than 21	. Second Rule evaluated ‘False’	because our Applicant State	was not NC	.